The ion mobility spectrometry technique offers advantages like high sensitivity (ppb range), fast response (ms range), compact design, operation in atmospheric pressure and ability to separate the isomeric compounds. As ion mobility spectrometers do not work in vacuum, the ion movement is not straightforward. There occur huge numbers of ion-molecule interactions between charged ions and neutral particles of a drift gas. Thus the ion separation in IMS is not based just on their mass but also on their cross section. This gives an advantage to the IMS technique for fast separation of isomers. In this Lab-Report we will demonstrate the ability of AIMS technique to separate the isomeric compounds. The whisky lactone (156,23 g/mol), γ-nonalactone (156,23 g/mol), δ-decalactone (170,25 g/mol) and γ-decalactone (170,25 g/mol) of analytical grade purity has been chosen as representative isomers. The IMS response of whisky lactone (156,23 g/mol) and γ-nonalactone (156,23 g/mol) isomers is shown in Figure 1. 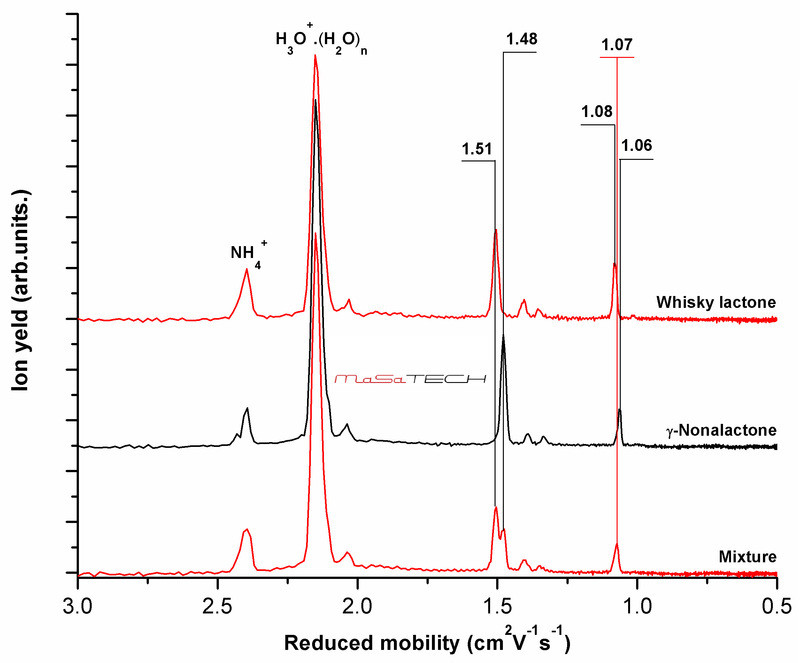 As we can see from this figure, the whisky lactone results in formation of two peaks in the IMS spectrum with reduced mobility 1.51 and 1.08 cm2V-1s-1. 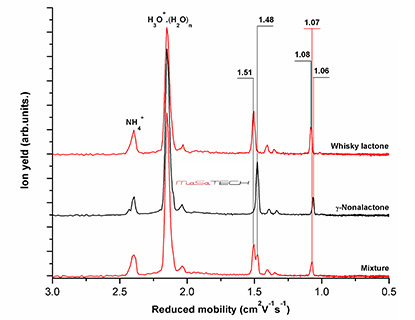 We have assigned the peak with reduced mobility 1.51 cm2V-1s-1 to protonated monomer H+.M of whisky lactone and the peak with reduced mobility 1.08 cm2V-1s-1 to its proton bound dimer H+.M2. In contrast to whisky lactone, the response of γ-nonalactone results in formation of peaks with reduced mobility 1.48 and 1.06 cm2V-1s-1. 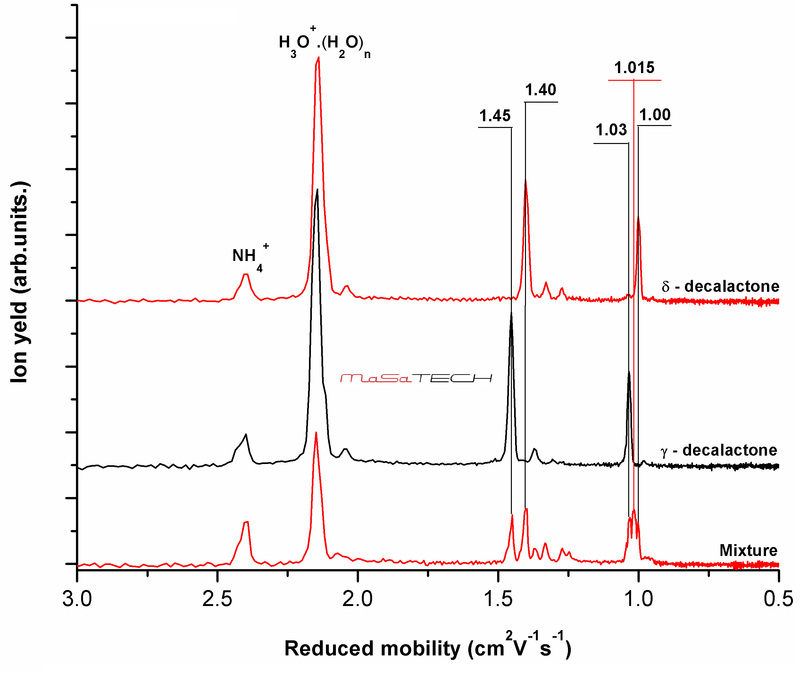 The peak with reduced mobility 1.48 cm2V-1s-1 has been assigned to protonated monomer H+.M of γ-nonalactone and the peak with reduced mobility 1.06 cm2V-1s-1 to its proton bound dimer H+.M2. The high resolving and separation factor of AIMS allows us to recognize this isomeric compounds also in their mixture as we can also see from this figure. In the case of mixture we also observed the new peak with reduced mobility 1.07 cm2V-1s-1 instead of proton bound dimers with reduced mobility 1.08 and 1.06 cm2V-1s-1. This peak belongs to the asymmetric dimmer complex formed from whisky lactone and γ-nonalactone isomers. The δ-decalactone (170,25 g/mol) and γ-decalactone (170,25 g/mol) response in AIMS is shown on Figure 2. As we can see from this figure the δ-decalactone results in formation of two IMS peaks with reduced mobility 1.40 and 1.00 cm2V-1s-1. 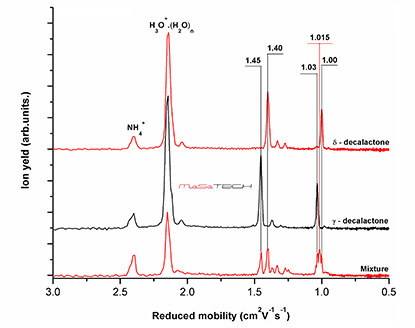 We assigned the peak with reduced mobility 1.40 cm2V-1s-1 to protonated monomer H+.M of δ-decalactone and the peak with reduced mobility 1.00 cm2V-1s-1 to its proton bound dimer H+.M2. In contrast to δ-decalactone the response of γ-decalactone results in formation of peaks with reduced mobility 1.45 and 1.03 cm2V-1s-1. The peak with reduced mobility 1.45 cm2V-1s-1 has been assigned to protonated monomer H+.M of γ-decalactone and the peak with reduced mobility 1.03 cm2V-1s-1 to its proton bound dimer H+.M2. Both analytes are easily recognizable also in mixture as it is demonstrated in the figure. In the case of mixture of δ-decalactone and γ-decalactone isomers, we can see both dimers with reduced mobility 1.00 and 1.03 cm2V-1s-1 in contrast to mixture of whisky lactone and γ-nonalactone (Figure 1). In addition to those dimers, we also observed asymmetric dimmer complex with reduced mobility 1.015 cm2V-1s-1 formed from both isomers. The high resolution Ion Mobility Spectrometer allow fast recognition and identification of isomeric compounds. In addition to the above mentioned benefits, it is possible to use it for study of isomeric dimer complexes formed in reaction region of IMS. © 2019 MaSa Tech, s.r.o.